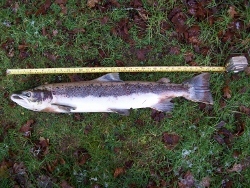 It’s good to see evidence that salmon are thriving on our river, theWest Webburn. A previous article I wrote told the story of the salmon smolts travelling successfully past our hydro scheme to continue their journey to the sea. During this winter we found a dead Kelt upstream of our system which measured 33” long. It is very pleasing to know that these magnificent creatures have managed to complete their journey fromDartmouth, despite the fishing lines. This is clear proof that they are reaching their chosen destination and are able to spawn successfully in the upper reaches of theWest Webburn.